Despite crystal clear sound, crackle-free delivery and nationwide coverage, American radio listeners have been slow to take up many satellite radio offerings. But, after years of indifference, consumers are now starting to take an interest in a new era of radio. One of the key differences from traditional radio is the wealth of choice. Operators like Sirius satellite radio offer channels covering everything from bluegrass music to professional hockey. It says its output is far more diverse than traditional US radio, which has become corporate and homogenous. 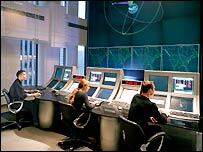 A sophisticated space control centre monitors three satellites 24 hours a day, as they beam down programming all over the US. "It is a digital signal, which allows us to get 100 channels down," said Christopher Croom, director of orbital operations at Sirius Satellite Radio. "There's no static, it's not like you're going to go out of contact and lose the station, or another station starts to interfere. It's digital quality and it's crystal clear to whoever's listening to it." 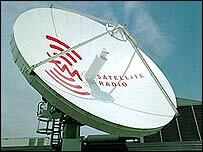 At its launch in 2001, satellite radio was targeted only towards motorists. It was the first time long-distance drivers in America were able to enjoy the same uninterrupted radio station for days at a time. Often in rural areas the only choices were country music, religious output or crackle. Since journeys can be long and laborious, across varying landscapes, the US was an ideal testing ground for the concept. "We love our cars, we're very particular about our cars, they're a personal extension of ourselves, so we're involved in what goes on in the car," said Mary Pat Ryan, executive vice-president of marketing at Sirius. "That's why satellite radio, which provides all the choices inside the car, is perfect for the American marketplace." The other major player is XM satellite radio, which has two satellites in space which also beam down more than 100 channels of content. But the technology offered from both companies comes at a price. Subscribers first pay for a radio receiver, then have to fork out $9.99 or $12.95 per month to receive content. Perhaps this is one reason why consumer uptake was slow to begin with. "No-one thought that people would pay for television, no-one thought that people would pay for water," said Chancellor Patterson of XM. "Our experience has been that people are more than willing to pay if you give them high quality content and a high level of service, where you literally never lose the signal driving from coast to coast, and in your home. "We expect that, by the end of this decade, we will have more than 25 million customers." Both companies recently overcame a major obstacle to subscriber growth with the introduction of portable receivers that can be taken from the car and into the home. Consumer interest has certainly increased in the past few months. Sirius now has more than 250,000 people listening, and XM has about 1.5 million. 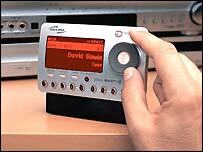 Both have commercial-free music output, another advantage over traditional radio which now squeezes up to 25 minutes of commercials into every hour of programming. Just in the past few months it has become obvious that satellite radio networks see the delivery of music and speech audio as just the beginning. They are now rolling out new services which, once again, are being targeted initially at motorists. "One thing that we have announced is actually putting video into the car," said Ms Ryan of Sirius. "We believe we'll be able to put four channels of video into the back seat, so you don't have to schlep your videos or DVDs and set up some gizmo for your kids to enjoy that long ride." XM is currently launching a new service of real-time data downloads called Instant Traffic and Weather. The satellite radio networks hope that, after a slow start, subscribers will find these new offerings not just useful but indispensable.